CFD modelling of fire development in metro carriages. CFD modelling is useful to make low cost parametric studies, possible after a model has been adequately validated. Design fires have great influences on the fire safety concepts and safety measures, and are the basis for any assessment and calculation in tunnel fire safety design. The best way to obtain a design fire for a specific carriage is to carry out full scale carriage fire tests. However, the costs of such tests are large and the number of the tests is typically limited. CFD (computational fluid dynamics) modelling could be a good alternative to reduce the cost and make parametric studies possible after the model has been adequately validated. Fire development in a train carriage is investigated by CFD simulations. Two methods, i.e. the simple ignition model and the kinetic pyrolysis model, are applied. In the simple ignition model, an ignition temperature is assigned to a combustible material which burns following a prescribed curve only after the surface temperature reaches the ignition temperature. In the kinetic pyrolysis model, the kinetic parameters of the reactions specified for each material are used to describe the reactions that occur within the solid materials while they are burning. The model parameters are estimated and calibrated based on data obtained from Thermo-Gravimetric Analysis (TGA) tests and cone calorimeter tests. One full scale carriage test carried out in the METRO project was simulated. The train model is shown in Figure 1. Figure 1. 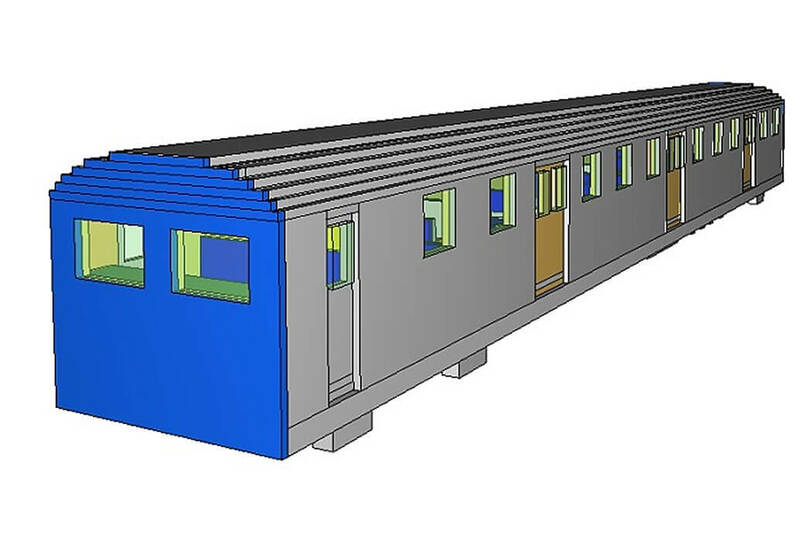 CFD modelling of fire development in metro carriages – CFD model of the train carriage. Comparison of the simulated heat release rate curves with full scale test data is shown in Figure 2. Both the simple ignition model and the kinetic pyrolysis model succeed in predicting the fire development in the carriage to a large extent. The simple ignition model predicts the heat release rate relatively well during the whole period with the only exception that the predicted fire growth rate is slightly lower than the test data. One possible reason is that the fire growth periods for different fuels were estimated from laboratory tests that could be longer than those in the full scale test where the radiation level is much higher. The maximum heat release rate is predicted well by the simple ignition model. In comparison, the kinetic pyrolysis model predicts the growth period well while the maximum heat release rate is much lower and the fire decays earlier. The energy content consumed in the simulation is also much lower than that in the test. These could be due to that some uncertainties were introduced for the parameters obtained from small scale tests and there could also be some fuels that were not accounted for. It is also found that the kinetic pyrolysis model is very sensitive to the thermal and kinetic parameters. Overall, the simple ignition model performed better than the kinetic pyrolysis model in predicting the fire development in the carriage. However, for any simulation using these models, validation is always required, due to the sensitivity of these pyrolysis models to the input parameters, especially for the kinetic pyrolysis model. Carriage fires in the tunnel under different ventilation conditions are compared with that in the open. Results show that the tunnel walls nearly have no effect on fire development in the carriage. Therefore the effect of heat feedback from tunnel structure is negligible for carriage fires. This is mainly due to the fact that the fuels in a carriage are not directly exposed to the tunnel structure. Carriage fires in the tunnel under different ventilation conditions are compared in Figure 3. The case with u=0 m/s corresponds to two open tunnel portals. For well ventilated carriage fires, e.g. when the longitudinal ventilation velocity is greater than around 1.5 m/s, the fire growth rate increases with ventilation while the maximum heat release rate is closely independent of the ventilation. For carriage fires under such conditions, the maximum heat release rate is approximately the same as that in a free-burn fire in the open or a fire in a short tunnel with no ventilation (u=0 m/s). When the longitudinal ventilation velocity is not greater than a certain value (e.g. 1 m/s) and the reverse flow is arrested by the incoming flow (e.g. in a long tunnel), the fire could be highly vitiated. The fire develops more slowly and the maximum heat release rate becomes lower, see Figure 3. We may call these fires as highly vitiated fires. For carriage fires under such conditions, the ratio of the maximum heat release rate to that in a well ventilated fire (or a free burn open fire) is around 0.6. The main reason should be that under such conditions, there exists a significant backlayering with a large amount of smoke, which is prevented by the incoming air flow and then blown back to the fire site, causing immediate smoke descent and vitiation of the fresh air at the fire site. However, in some cases under low ventilation, the reverse flow could not be arrested by the incoming flow, e.g. in a short tunnel or in a tunnel with no dominating ventilation (closely 0 m/s). In such cases, the smoke could flow out of the tunnel through both portals and there could be only a small portion of smoke entrained into the incoming flow and blown back to the fire site. We may call these fires as lightly vitiated fires. The vitiation effect, therefore, depends on the tunnel length and the fire location relative to the portals. For a carriage fire in the middle of an approximately 100 m long tunnel, the ratio of the maximum heat release rate to that in a well ventilated fire (or a free burn open fire) is around 0.9. This ratio is expected to be slightly lower for a longer tunnel, but may not be lower than 0.6 which corresponds to highly vitiated fires. From the point of view of ventilation effect on the fire development in such a metro carriage, the distinction between the well ventilated fires and highly vitiated fires lies between 1 m/s and 1.5 m/s. Note that if the fire size is smaller, both the amount of oxygen consumed and the mass flow rate of the reverse flow are reduced, which indicates less significant effect of vitiation on the fire development. Under such conditions, the transition point between well ventilated and vitiated fires could be lower. It should also be kept in mind that all the carriage fires discussed in this work are fuel controlled, despite the fact that inside the carriage the fire could be ventilation controlled to some extent, i.e. local flashover. In contrast, some large tunnel fires, e.g. tanker fires, could be closely ventilation controlled (fuel rich), that is, the heat release rate is directly related to the fresh air flows that are entrained into the fire site.